This is a very tough story about how our lives can change in an instant, a very serious addiction and what our manifesting and prayers can overcome. Michael has had success stories in this newsletter before. The accidental detour in his life almost killed him but he remembered the power of manifesting and prayers. Michael and his daughter are walking miracles. I do home cleaning and I was out on a call one evening in 2008 and brought my dad and my 5 year old daughter along. After the job was done the owner of the property asked my daughter if she would like a lucky horseshoe. She excitedly agreed to the man’s thoughtful offer. We started our trip back home with my dad in the front seat and my daughter settled in among the heavy equipment in the back (yes, I know about that now.) Then it happened. We were a hit head-on by another car. It wasn’t my fault but it didn’t matter. Upon impact, my dad was pulled to the left and my daughter shot forward, hitting my dad who was fortunately blocking the space between the two front seats. My dad was mildly injured and my daughter had a small scratch on her knee. The angels were watching over them both and I am so grateful that they were spared serious injury. I suffered a very painful back injury involving 4 discs. The insurance companies got involved right away with my treatment. I was having a lot of difficulty walking and the pain was severe. I was in the care of the insurance company for four years with ever-increasing dosages of opioid medications to combat the pain. At the end of those four years I was still suffering pain and now I was on my own medically without insurance coverage. I realized that may have become seriously addicted to those medications. I was living with a girlfriend at the time and looking back, we were both seriously addicted and co-dependent. I had gone from being a pretty good father and businessman to someone I wouldn’t recognize today. The desire for those drugs was overwhelming. I was heavily addicted to taking oxycodone, 1 pill every 3 hours. I began to buy drugs on the street. I would have never imagined it, but getting those powerful drugs was my number one priority. I was oblivious to just about everything else. It was a very low, long series of years. I had a sizable financial settlement from the accident and I spent down about half of it buying drugs illegally.This wasn’t how I wanted to continue living, so I turned myself over to a methadone clinic. It is somewhat easier to loose a methadone addiction than the opiates. For the sake of my daughter and for myself I had to find normal again. I could begin think somewhat beyond myself and I began a manifesting plan where I was clear of drugs. As if I were in a movie, I visualized a future where my house was all fixed up and that my daughter and I were enjoying the big back yard together. I also began to pray for help because I was at the bottom. It gets worse. During the time of my addicted fog I made a couple of bad decisions in my business practice that landed me in the criminal justice system. I lost my court case resulting in my being incarcerated AND heavily addicted. I would not be able to access the methadone in jail and now I would be coming off drugs in a cold turkey fashion. By the way, methadone is 10 times harder to get off than opiods. I will spare you the horrible details.Those 21 days without drugs for the first time in years were the hardest ones of my life but I held onto to the bright future I was manifesting and praying about for my daughter and myself. Shortly after my release I was back home, but then my lights and water were disconnected. I also received notice that my home was in foreclosure status.Knowing the darkness that I had just came out of, I was not throwing in the towel. I got back to work immediately. Being locked up was actually a Godsend, and in a short time I was back, healthy in mind and body! Now I had to tackle those back bills. With the help of a kind neighbor for a month I had the time to quickly get back on my feet. It was a cold Denver winter and it became obvious that I had to make some changes fast. Mercifully, a large job appeared and I was finally able to pay my overdue bills, restoring power, water and getting my home out of foreclosure proceedings. Seven years after that accident I was finally clear,free from prescription opiates, heroin & methadone.I’ve been blessed that somehow my family and home have been preserved. My bills are up to date and I am getting back to normal. I now understand why so many people are addicted to these opioids.They are so incredibly powerful I had no defense for it. I empathize with the millions so quickly addicted to these drugs and all the sorrowful things that go come with it. My daughter has seen enough regarding addiction and she is in no way attracted to anything that is mind altering. After all I’ve put her through, I’m glad for this positive outcome. I feel the same way myself. No more. Now all is normal as life allows. We are the fortunate ones and I am grateful every day that the wonderful outcomes I prayed for and worked to manifest have come true.I completely have my life back but I believe it took confinement to break my addiction and downward spiral. Sometimes what we pray for and work to manifest come in unexpected ways. WOW, that is an epic story. Infinite love and prosperity to you and your daughter. This book is a wonderful ‘how to’ recipe for those new to manifesting and for those who have been practicing other methods for years. The author lays out the steps to his simple yet powerful approach in an easy to read format. The stories he includes, which illustrate the manifesting success that he and others have achieved with this method, are not only fun and inspiring but show that we all can do this too! 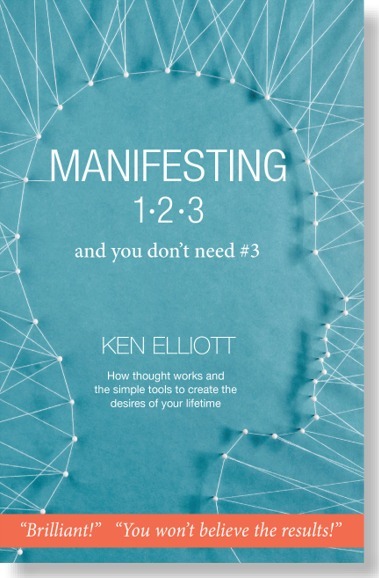 Just as the title indicates, manifesting really can be as easy as 1-2-3!